I am happy to announce that I have once again had the honor of collaborating with a designer who's artistic vision never ceases to amaze me, Matt Doughty of Onell Design. Matt did an amazing job on the head sculpt of this next iteration of the Monster Hunter Robo. And you can get your hands on one of your very own, tomorrow through Thursday at New York Comic Con. The Godbeast and I will be at Onell's booth #3216 in The Block from 6-9pm on Thursday, 1-4pm on Friday and 1-4pm on Saturday. This classic 5.5" action figure-style resin art toy features a body that was sculpted by Ben Spencer and hand cast in resin by The Godbeast as well as a head that was sculpted by Matt Doughty. Additionally, the figure was painted by Matt Doughty. Galaxxor 010 features 3 points of articulation and comes packed in a traditional bag and header style with exclusive header card art Ben Spencer. This figure is limited to an edition of 5 for NYCC. 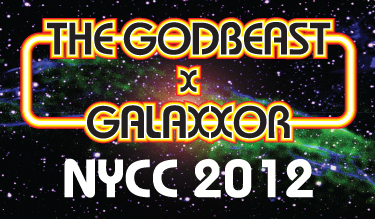 Galaxxor 010 will be $125 each and available exclusively at booth #3216. Cyborg Space Barbarian Infernicus Drops at NYCC! Perhaps the most feared of General Gorgax's elite cadre of Cyborg Space Barbarians is Infernicus, Dark Champion of the Elemental Flame! 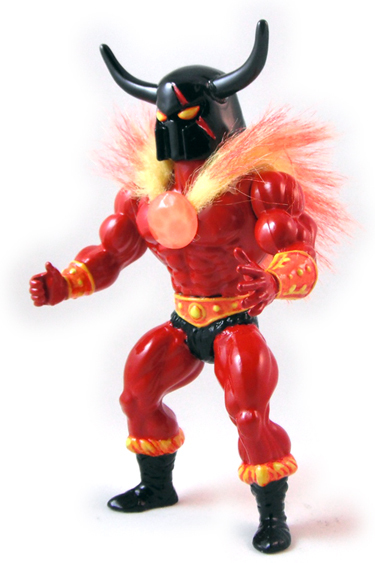 This Cyborg Space Barbarian figure consists of a helmet that was originally designed and sculpted by Ben Spencer and produced in resin by Marty "The Godbeast" Hansen. These Cyborg Space Barbarian figures also feature bodies from disused vintage Masters of the Universe figures that were rescued from second hand stores, flea markets and the like, and brought back to brilliant life with hand painting and tlc from Ben Spencer. 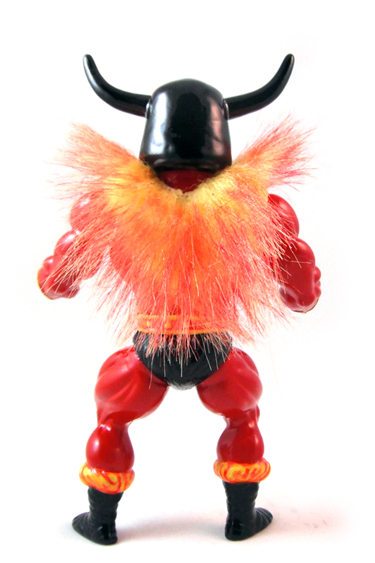 This figure is limited to an edition of 6 and will never be produced in this colorway ever again. 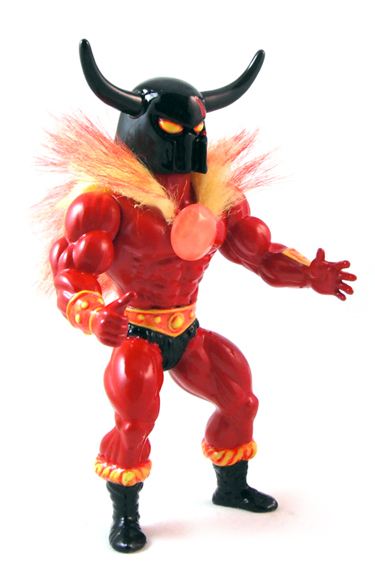 All 6 Infernicus figures will feature a horned helmet with scarred left eye, The Cloak of Flame and The Infernal Jewel of Kozzuth. 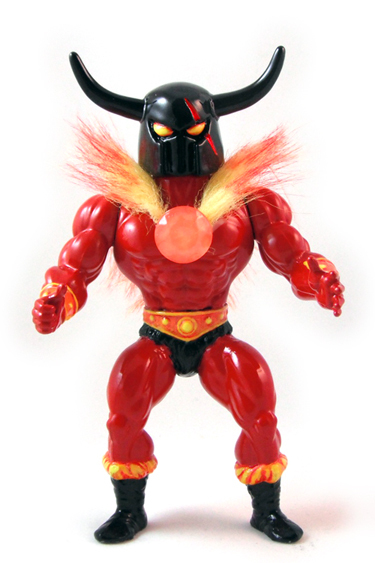 Infernicus will be available for $60 each at Onell Design's booth #3216 in The Block at NYCC, beginning 10.11.12. 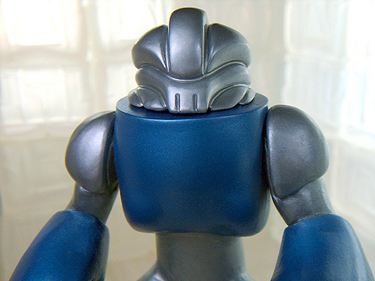 Stay tuned for another announcement about the second exclusive, a Galaxxor with a new head sculpted by Onell Design's Matt Doughty!